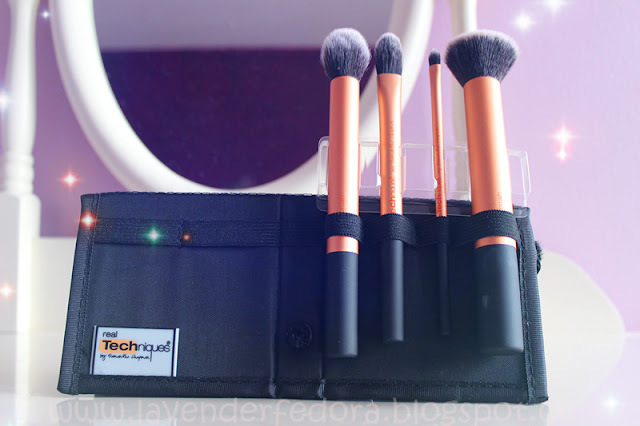 I’ve heard numerous ravings about the Real Techniques makeup brushes and trust me, I’ve tried as many ways as I can to get my hands on them without much success. And guess what, I finally got them!! I had a friend who went over to the States during the March Break, and as soon as I heard that she was going, I asked her to get the brushes for me. Here they are! I believe the most famous brush out of all the RT brushes is the buffing brush. So the first thing I asked her to get me was the Core Collection. Sorry if it’s a little bit dirty cuz of course, I had to try them out as soon as I got it. It’s phenomenal! It blends your foundation like a dream and it’s so soft. I love those brushes for multiple reasons. First, it’s really quite affordable. The whole collection comes with four brushes: buffing brush, contour brush, detailer brush and pointed foundation brush. It also comes with a case and stand 2-in-1 which I think it’s so smart. The whole set is only $17.99. I would pay that much money just for the buffing brush alone. Also, the brushes are so adorable. Yeah, the MAC brushes are classic but they’re so boring. The black handles do nothing to my cute makeup counter. Those brushes, on the other hand, add such a nice pop of color! The yellow is so unexpected yet chic! They don’t look cheap at all. And of course, the brushes are extremely well-made and I love Samantha from pixiwoo on YouTube. I’d love to support her for all the amazing work she does. Next, I got the Your Eyes Enhanced Starter Kit. 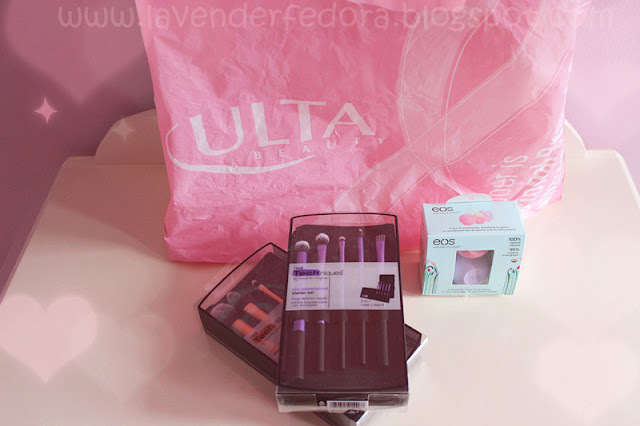 Initially I saw on the Ulta website that they had a buy one get one half off sale on all the RT brushes and that was why I wanted the set. However, I ended up paying for the full price but that’s OK! 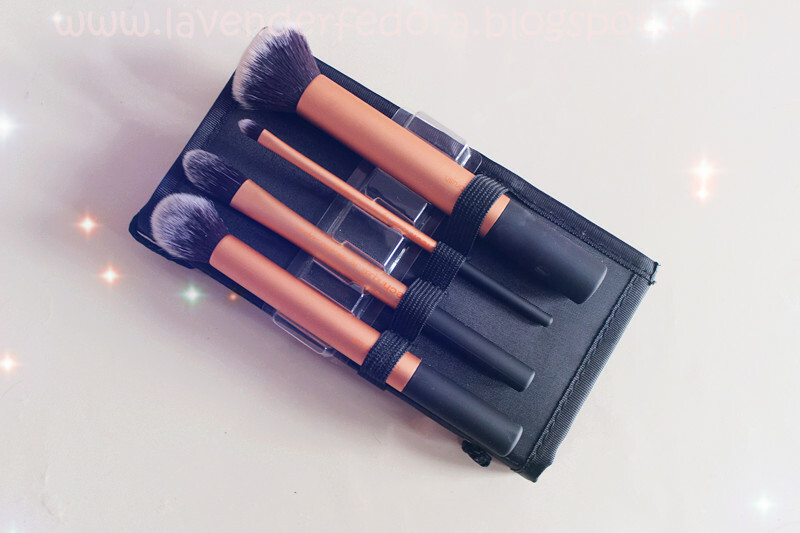 The brushes are again very well-made and they’re in this nice purple color. 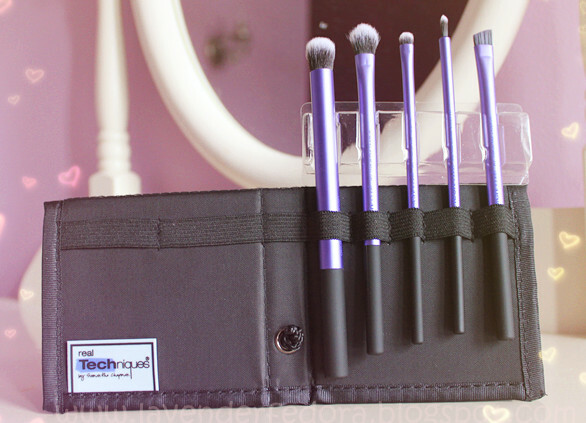 The set includes: base shadow brush, deluxe crease brush, accent brush, pixel-point eyeliner brush and a brow brush. Again, it comes with a case and stand 2-in-1. The price of this set is also $17.99. I haven’t tried any of the brushes but I’ve always seen Sam using the deluxe crease brush to blend her under eye concealer and her makeup always looks flawless. I can’t wait to try those brushes out. Who isn’t obsessed with EOS lip balms? I know I totally am. I was devastated when I missed the change to get the Alice in Wonderland Collection and now my friend was going to the States, I asked her to get me the passion fruit one. This one I believe only comes in a set with the strawberry sorbet and it’s in such a lovely lavender color. It smells amazing too. I can’t quite place what it smells like since I have no idea what passion fruits are but it smells amazing as always. 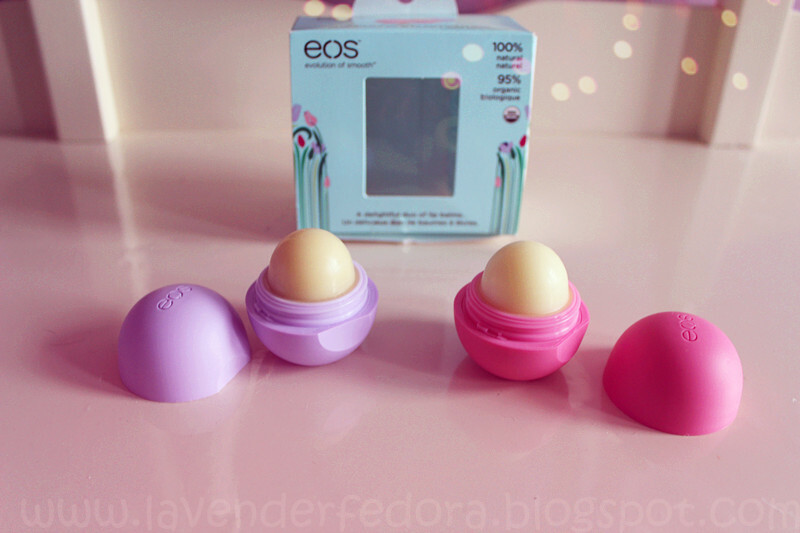 I love the EOS lipbalms. I haven't tried the RT brushes but I've really been having my eye on them. I think I'll pick some up this week. 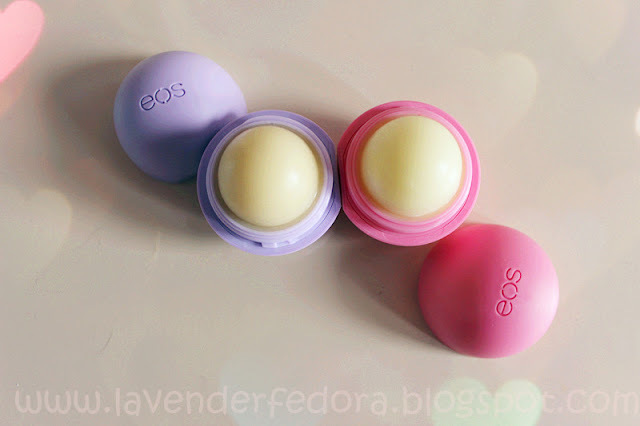 Also, I bought a 4 EOS lip balm pack from the Canadian costco for 10 dollars. I really need to check these brushes out some time, they look really good! hehe they're quite amazing! Hope you like them when you try them out! I love the packaging of the EOS balms - so cute! I'm nominated for Liebster Award! !